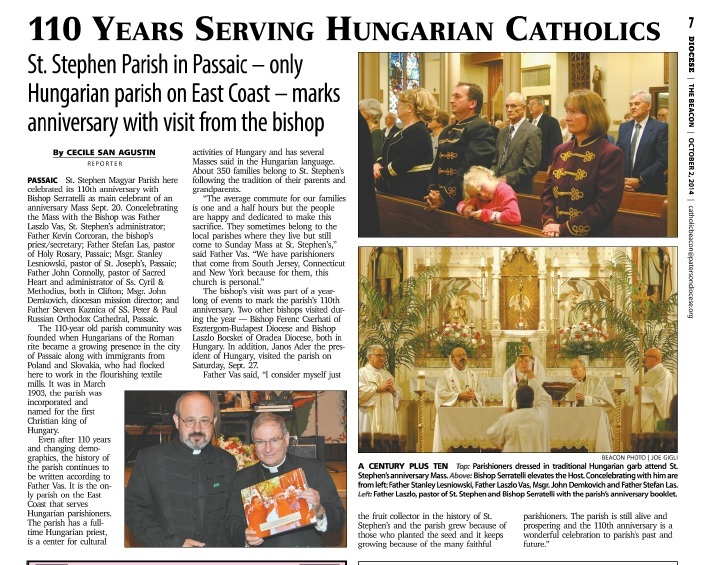 The 110-year old parish community was founded when Hungarians of the Roman rite became a growing presence in the city of Passaic along with immigrants from Poland and Slovakia, who had flocked here to work in the flourishing textile mills. It was in March 1903, the parish was incorporated and named for the first Christian king of Hungary. Even after 110 years and changing demographics, the history of the parish continues to be written according to Father Vas. It is the only parish on the East Coast that serves Hungarian parishioners. The parish has a fulltime Hungarian priest, is a center for cultural activities of Hun gary and has several Masses said in the Hun gar ian language. About 350 families belong to St. Stephen’s following the tradition of their parents and grandparents. The bishop’s visit was part of a yearlong of events to mark the parish’s 110th anniversary. Two other bishops visited during the year — Bishop Ferenc Cserhati of Esztergom-Budapest Diocese and Bishop Laszlo Bocskei of Oradea Diocese, both in Hungary. In addition, Janos Ader the president of Hungary, visited the parish on Saturday, Sept. 27.